Lush displays of annuals at Pat’s IGA in Hancock provide garden Zen without effort. I think it was March. I know it was madness, that dark, dead part of Copper Country winter that in some other parts of the world is known as spring. I’d fallen into the hellish melancholy of untreated Seasonal Affective Disorder. I didn’t know I had SAD until years later I interviewed SAD sufferers. Their recommendations became part of my self-care routine, including sun-mimicking artificial lighting and vitamin D supplements. But at the time the only safety net between me and utter despair was a compassionate colleague. The daughter of a hometown doctor and a home-ec expert, Candy is a pro at assessing the ailing and taking them in hand. No room for argument. 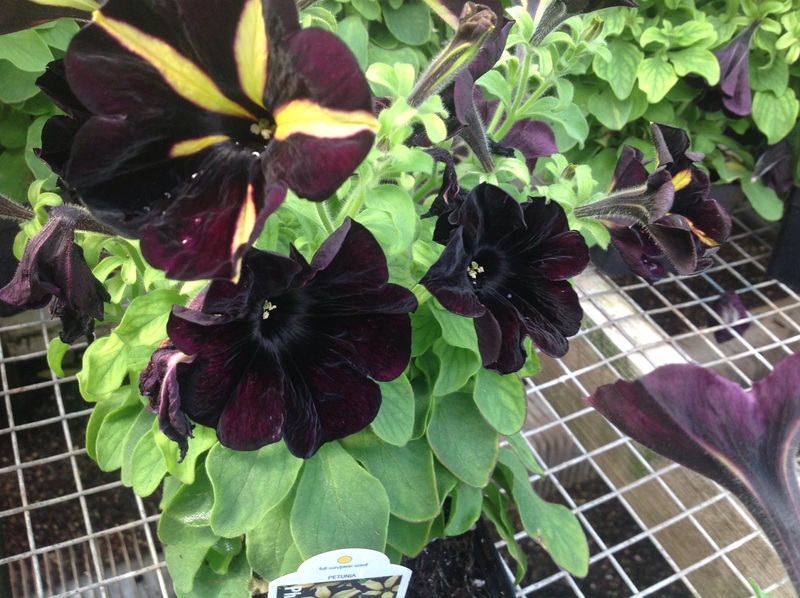 Velvety black petunias and this blackish-gold variety are drawing oohs and ahhs at Flowers By Sleeman this year, a perfect homage to nearby Michigan Technological University and its black-and-gold school colors. “Go to the greenhouse,” she ordered. 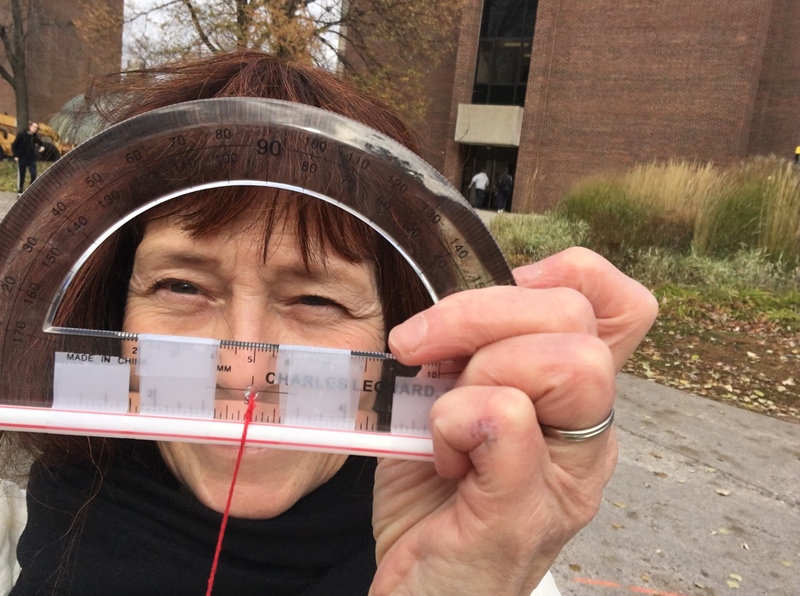 She’d arranged to have an eyedrops prescription called in for the stye forming on the lower lid of one twitchy eye. “I don’t have time,” I said. Candy insisted. We were off deadline, the Daily Mining Gazette had been put to bed for the day. I had to go to the drug store for the drops anyway. So why not stop by Sleeman’s Greenhouse? It was just what the doctor’s daughter ordered. The warm, humid aroma of green growing things lulled and invigorated me simultaneously. Do you know that dirt-roots-sprouting shoots smell? You should. Though the day was cloudy light reigned in this heated plastic cocoon. Most seedlings were not fully developed but many were forming buds and a few more mature varieties were showing their colors. The giant jade tree that nursery owner Bill Sleeman inherited from his mother was (and still is) holding place of pride. Something angry, depressed, overwhelmed and anxious had been released in realizing that no matter what my day held, no matter what the weather did, in this place and time each plant was just doing its thing without regard for the past or the future. The plants didn’t care about deadlines or pages to be laid out or chauffeuring my children to their after-school activities. 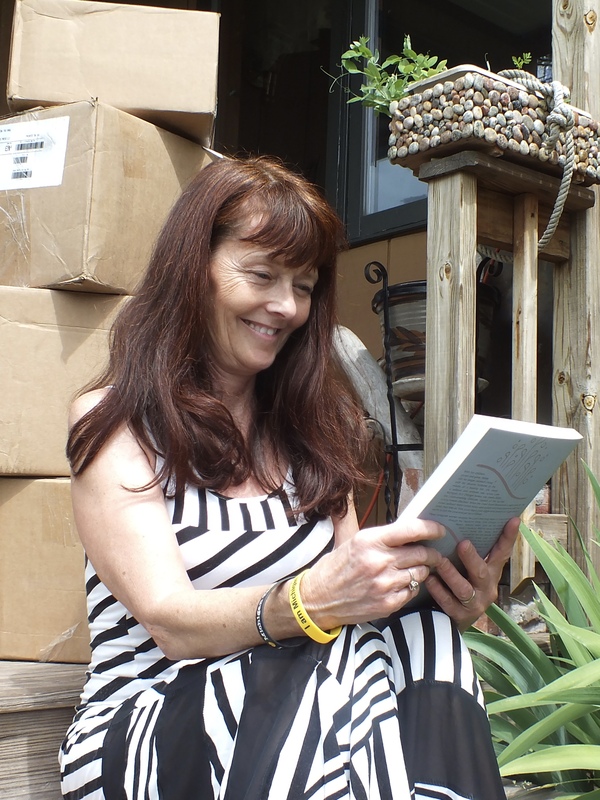 It was a perfect Ram Dass moment: Be Here Now. I’ve never forgotten Candy’s remedy. I still use it, especially in cruel Upper Michigan spring when it’s still too cold to plant anything outdoors. When it snowed in early May I visited that century-old jade tree again. 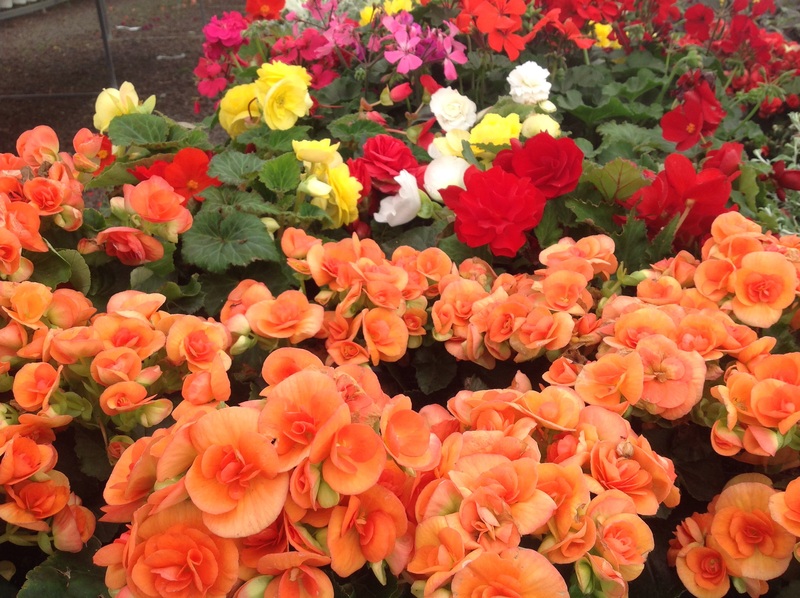 Greedy for green, I also visited Pat’s IGA’s seasonal garden center. Today I’m reviewing those inspiration shots as again Upper Michigan gardeners are called to patience, with frost warnings intruding upon the Keweenaw Peninsula’s short, intense growing season. At least the chill is preserving the apple blossoms and lilacs that now grace our landscape. That’s progress, Mother Nature-style. 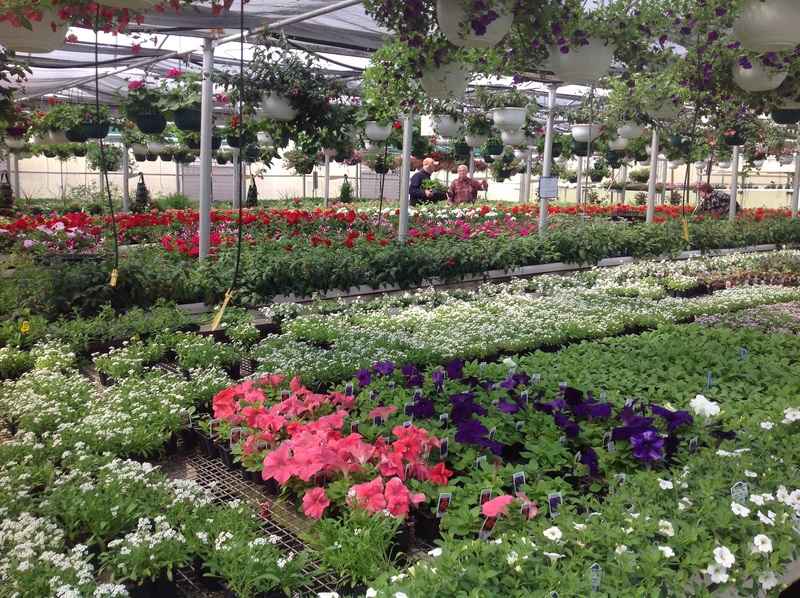 Never underestimate the power of a greenhouse to lift your spirits and delight your senses. Rest your eyes. Shut off any must-do scripts looping through your brain. Even if gardening isn’t your thing, there is peace to be found. 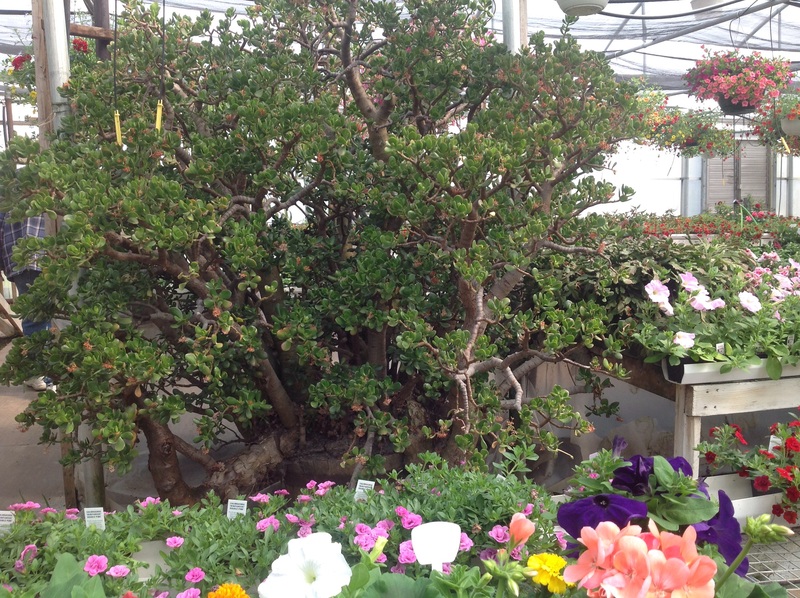 Bill Sleeman’s mother started this huge jade tree, which is now at or near the century mark in the Flower’s By Sleeman greenhouse. It blossoms every spring. Jades like to be root-bound, to a point. Bill was surprised to find that the plant did not need re-potting last time it was checked. Its roots have not grown through the bottom of the container. Bill Sleeman, right, chats with a customer. It’s always fun to ask him what’s new in the growing game this year and to get advice on when to set out plants. He doesn’t mind when people stop by for a little flower therapy, either. 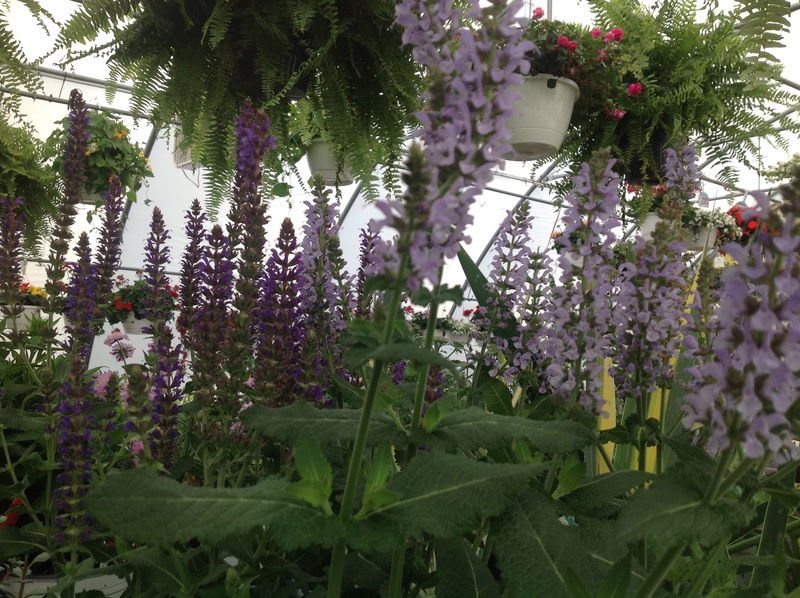 A sea of purple lupine and verdant fern-bedecked baskets soothes the soul at the Pat’s IGA greenhouse, which is only open during gardening season. Other area options include Shopko, Wal-Mart (I enjoy the Bonnie brand of herbs) and the heirloom-seed/seedling nursery out in Boston Location that I am looking forward to visiting later this spring. Garden design rules generally call for judicious use of massed monochromatic or a few combined colors. 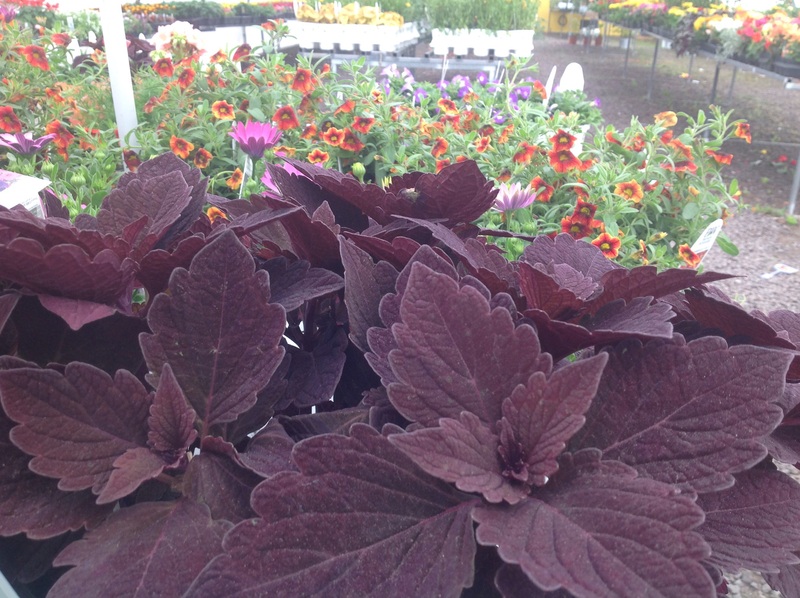 But shades, shapes, textures and sizes run rampant in the greenhouse and that riotous tangle is fun and uplifting. We were in Maine during a cool, damp spring, before the tourists descended. It can be a little bleak in that latitude, but the fields of blooming lupines everywhere saved us. Sensory therapy indeed. Lupine just beginning to form buds here. I transplanted from the wild so have three spots going now. Definitely a favorite. Hope to get back to Maine one of these years. Last time the highlight was Perkins Cove, lol. Tell me they had T-shirts … you know, the two most intoxicating, relaxing, alluring flowers we experienced in Maine were the lupines and the sea roses. I was a little chuffed to learn that neither is a native to the state. Someone had great taste. Need to return for shirts. Framed the postcard.